In an update to its Investor Releations webpage on Monday, Apple announced that its next quarterly conference call will take place on April 23, and is expected to cover the company's second quarter performance including profits and sales numbers. As usual, Apple's conference call will discuss the financial results for the company's fiscal quarter two, which spans from January to March. Apple CEO Tim Cook and CFO Peter Oppenheimer will likely be on the line to explain the results and offer a forecast for the next quarter. During the company's last quarterly conference call, it was announced that iPhone sales reached 47.8 million units over the holidays, a 29 percent boost from the same period a year ago. iPad sales were also strong, growing 48 percent year over year to 22.9 million units, but lower margins on the iPad mini held revenue growth for the tablet lineup to 22 percent from the year ago quarter. 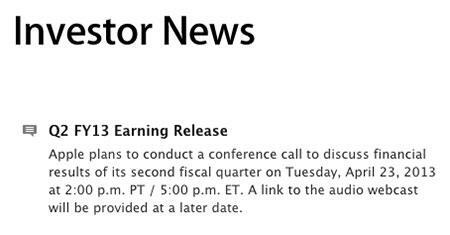 Apple's conference call for the second quarter of 2013 is scheduled for Tuesday, April 23, at 2 p.m. Pacific / 5 p.m. Eastern. AppleInsider will be covering the call live, while an audio webcast is also to be made available.